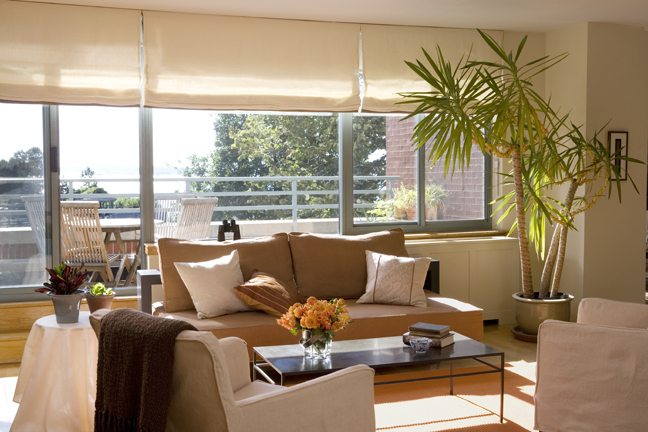 Rooms with fresh flowers and open views help sell homes by firing on all the senses. 1. Good neighbors. Well-kept neighboring homes can make or break the sale of your own home. “Many a buyer has pulled up to an amazing house, viewed it, and left shaking their head with woe because they just can’t cotton to buying the place on account of the shoulder-high weeds, car in the yard or crumbling ruins of the house next door,” says Nelson. On the other hand, your neighbors themselves can actually help sell your home. “Many homeowners know people who want to live in their neck of the woods; this is one reason many seasoned real estate professionals hold their listings open to neighbors and send out postcards to neighbors announcing the listing – the neighbors might know people who are interested in your home! Also, neighbors who are out and about chatting with each other, laughing and playing with their kids, mowing their lawns or painting their fences, or even who just offer a smile and helpful area knowledge to the buyer-to-be they pass on the street can make a very favorable impression on prospective buyers,” she says. For more real estate tips, visit Trulia. Or if you’re in New York and you’d like to find out more about real estate market trends in Manhattan, please leave a comment.